Lower Antelope Canyon is a popular attraction about 5 miles outside of Page, Arizona. The V shaped canyon, meaning it is wider at the top than the bottom, is famous for its rock shapes. Though not as popular as Upper Antelope Canyon, known for the light rays that filter in the canyon, Lower Antelope Canyon is still a special place to visit. In addition, in certain winter months, like November, the famous light rays don’t make it into Upper Antelope Canyon, making Lower Antelope Canyon an excellent alternative. 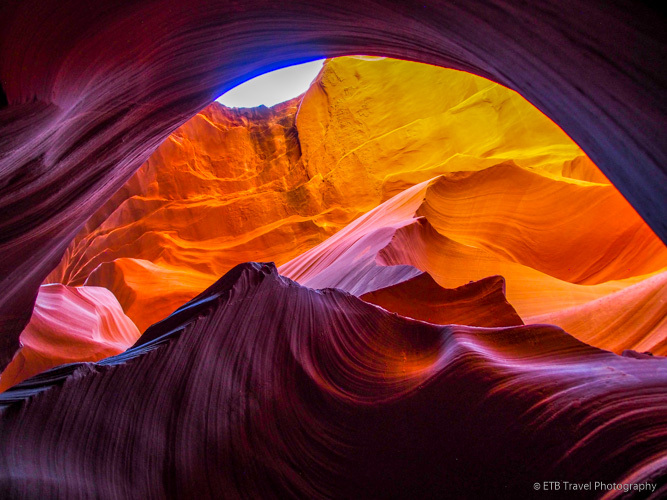 Both Upper and Lower Antelope Canyons require a guided tour and Indian Reservation permit. The Upper Antelope Canyon costs much more to tour than the Lower Antelope Canyon. Two sister companies operate the tours of Lower Antelope Canyon. The tours and permit may be purchased online or in person, though advanced reservations are recommended during high season. During low season, I made “day of” reservations with Dixie Ellis because I liked their website better. Having said that, Ken’s operates the same tour and has been in business longer. Owned by the same family, the tour companies each charge $48 which includes the permit fee. The tours operate every 15 minutes from morning to evening. Selecting the first or last tour of the day in order to enjoy a portion of the canyon empty is the only reason to be picky about the tour company. Dixie Ellis operates the first tour of the day, and Ken’s operates the last tour of the day. I selected what I thought was the last tour of the day, but it was with Dixie Ellis, so another group still followed us. Fortunately, the tour guides are generally good at keeping the groups contained and provide a decent opportunity to capture images. Moreover, they know exactly the best places to snap a photo in the canyon. Unfortunately, for our small group of five in the off-season, a Chinese contingent followed who completely disregarded their guide and the rules! I was shocked when our guide Isaac, a recent high-school graduate who loved rocks, shouted at those who invaded our space in Chinese. Apparently, “STOP…Go back to your guide” translated into Chinese is common in Lower Antelope Canyon! The tour of Lower Antelope Canyon lasts about an hour and covers a distance of one mile. Isaac, enthusiastically led us to the entrance where he provided the number of participants in our group to the counter. We climbed down the ladder into the narrow canyon. We walked across raised metal platforms covered in sand made to look like the canyon floor. I would have never known this if Isaac hadn’t mentioned it. I felt a little upset that they adjusted the floor level of Lower Antelope Canyon to make it easier for tourists to walk through the narrow spaces. While I wished they kept the canyon natural, I understand the change to reduce injuries and make more money. Deep down I hoped that the raised floors protected the canyon from erosion that would be caused by visitors stepping on the canyon walls in the narrow areas. Off my soapbox now, there are no words to justifiably describe this canyon. Isaac led us from narrow cracks to open rooms within the canyon. He pointed out rock features such as an Indian Chief and a lady in the wind. In addition, he took photos of each us and showed us exactly how to capture amazing images of the light in the canyon. Some shots required sitting down, while others required leaning back or forward. I could have spent hours looking at the striations, rock formations, and light in Lower Antelope Canyon. What I found more amazing is the camera lens picks up much more light than the naked eye. In some cases, I could see a rainbow through my lens but only a faint difference in a color or two on my own. The captured images came out better than the eye could see. A rare occurrence! On the way back from the canyon, Isaac pointed out some dinosaur tracks. Then with a bottle of water and sand, he knelt on the ground and demonstrated how sandstone and canyons are made. It would be a fun project for school kids! Anyway, at first I thought $48 was a little pricey for an hour tour and a mile walk, but I changed my mind upon reviewing photos as I took them on my iphone with a filter. The shots on my camera came out better than I expected too! I highly recommend visiting Lower Antelope Canyon either in the early morning or late afternoon when the light reflects on one side of the canyon or the other. Spectacular! What an exciting tour! Your photos are wonderful.